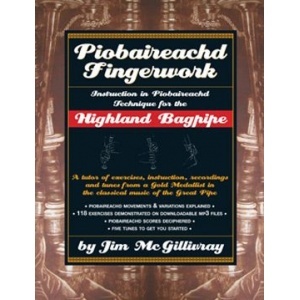 Jim McGillivray's Piobaireachd Fingerwork breaks the difficult technique of piobaireachd into bite-size morsels that are understandable and that come together into complete movements. 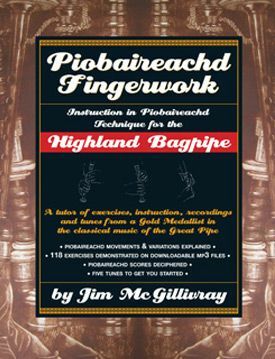 There are 118 exercises and five complete piobaireachds to help you put the exercises into practice. All are recorded into mp3 files that are easily downloaded from a web location specified in the book. 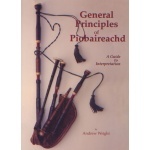 The book deals not only with piobaireachd movements, it also describes the most common piobaireachd variations (dithis, siubhal, breabach, etc) and how they have been traditionally played. One whole chapter is devoted to how to read scores as printed in the Piobaireachd Society and Kilberry collections. 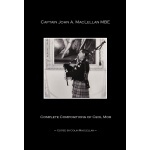 Another details the intricacies of canntaireachd, the pipers’ musical language. 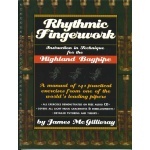 Piobaireachd Fingerwork even addresses movements as they were published well before the Piobaireachd Society, in the works of Angus Mackay, Donald MacDonald and others. If you’ve always wanted to try piobaireachd, or if you want to improve your fundamentals in a logical, proven, and easy-to-understand method, this is your chance!